Copyright is a problem on the internet with most people not realising they are in breach of copyright by using someone else's photography without their permission. Most think that because you have posted it on the internet that it is free to use and it's more of a lack of education than a deliberate attempt to cheat the photographer or the hosting company out of their rights. This isn't helped by various search engines indexing your photos and displaying them in results when people search for images. Firstly, put your meta data in the photo. You would be surprised how few people check to see whether the meta data specifically says that it is copyright and who it belongs to. Meta data is vital to help people ascertain whether an image is being used without permission and allows people to check whether it is okay by contacting the photographer / hosting company. Make sure your name, contact details and more importantly whether it is copyright or not is in the meta data. Most reputable printers and web companies will check this and because it is not visible and obvious to the average person they are easily caught out. It's easy to do as well - just right click on the image and choose properties then click on the details tab. You can easily add a Title, Comments and Copyright status. The more information you provide the better. Of course someone could always strip this data out of the image whether intentionally or not (image optimisers do this) but at least if you left it in the original you can work out who or what removed it. It makes it a lot harder to claim innocence if you deliberately removed the meta data and if you do not put meta data in the photo in the first place then how can you expect people to check whether it is copyright! Secondly, do not put high resolution images on the web. Most printers are able to work out whether an image has been downloaded from the web by checking the resolution but if you go and upload a high resolution image on the web and don't put any meta data in it then the assumption has to be that the person using this image owns the copyright to it. Thirdly, if you absolutely must have a high resolution image on the web then put a water mark on it. A large © in the middle set with a transparency of 20 - 30% opacity using a bold font makes it very difficult to remove by touching it up in a photo editing application. Even better put a soft edge shadow around it or emboss it which makes it even harder to touch out. Fourthly, if you personalise the photo name then it makes it a lot easier to find on the internet. e.g. 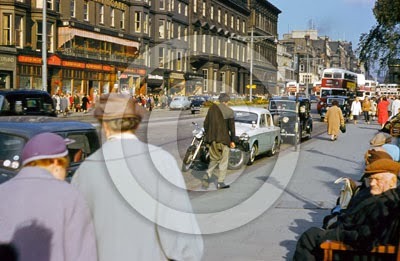 dsc0001.jpg is no use but 1950's-Edinburgh-Princes-Street.jpg is very easy to find in a search engine. If you are using a content management system then make sure that it displays the name of the file on the actual web page so that the search engines are able to index it. This makes checking a lot easier. Lastly, if you do spot a copyright breach don't jump off the deep end. Try and establish whether it is a genuine error or not. Could it be an employee who has since left? Or perhaps they have been misled? Either way ask them to take it down, or a smart photographer would ask for a credit and a link back to their website and gain some publicity. In conclusion, adding meta data to your photos, watermarking high resolution photos and uniquely naming them on the web will go a long way to preventing ambiguous copyright breaches.